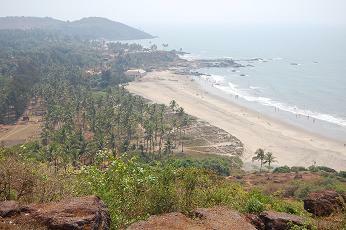 The Vagator beach area is formed by a trio of beaches or coves, separated by jagged rocks. Big Vagator, the largest of the three, sits below Chapora Fort to the north. The coach and car park is just behind tiny Middle Vagator and to the south, Little Vagator (Ozran) is the stronghold of long-term Israeli and European travellers. Beautiful and often fairly quiet, Big Vagator is perhaps best appreciated from Chapora Fort, where stunning views of the surrounding coast make the climb a must. With plenty of character, Little Vagator is filled with laid-back, long-term travellers smoking chillums and listening to psy trance music. Just behind Ozran beach lies Disco Valley, once a common site for full-moon parties when the Goa trance scene enjoyed its heydey. Government bans now mean that such parties are virtually impossible, but the nostalgia felt by many returning visitors to Goa is palpable here. 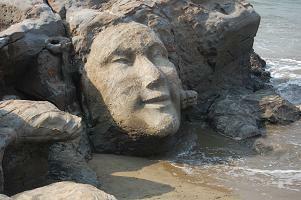 On the south side of the beach, an anomymous sculptor of the Hippie era has carved a serene face staring skywards from the rocks. If you have a favourite Goa beach and would love to share it with our other readers, leave a message on our site! The Nine Bar behind Little Vagator (Ozran) beach is legendary in Goa. Come here to listen to Goa psy trance and enjoy sea views through the palm trees. The late night amplified-music ban means the party often dies down by 10p.m., but you may get news of other events from here. 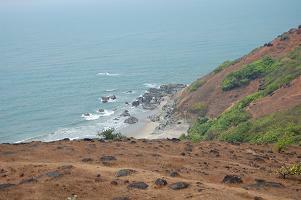 Climb up to Chapora Fort for sweeping coastal views and the possibility of seeing the wild jackals that live there. The fort was built in 1617 by the Portuguese as a watchpost. Sunsets on Vagator are beautiful, and the rocky headlands make for a dramatic sea scape. Enjoying a cocktail on the beach as the sun goes down, talking, evesdropping, musing, is a great way to spend the evening. Hill Top between Vagator and Anjuna is another venue to check out if you are seeking psychedelic sounds. New Year's Eve and Christmas parties attract huge crowds, and the odd party slips through the net throughout the year. Talk to fellow travellers on Ozran beach for news. Reach Vagator by regular bus from Mapusa. The 19 km journey ends where a road forks north towards Chapora village and west towards Vagator. It is a 1km walk west along Vagator Beach Road from here to the sea. The road divides in two just before the beach, with the northerly branch heading to Big Vagator, and the southern route taking you through the car and coach park on to Ozran (Little Vagator). The Vagator Beach Road offers several guesthouses and restaurants, and you'll find more if you take the turning south towards Anjuna. China Town (on the turning) is good for cheap, tasty food. Continue south for mid-range accomodation (Rs. 600 - 1000) such as Bethany Inn, Boon's Ark and Julie Jolly. Vagator beach has several shacks serving the usual traveller's food. If you fancy something different, try Bean Me Up, an institution in Goa, which is near the petrol pump on the Mapusa / Anjuna road. This place serves healthy food with huge salads, fruit juices, pizza and plenty of tofu. On the weekends Vagator fills up with day trippers from Goa and the surrounding states and the area around the coach park often gets very crowded, especially at sunset. The alcohol fuelled atmosphere that sometimes develops may feel intimidating for female travellers / groups. Dressing modestly will certainly help. Exploring India's beaches needn't stop at Goa. The beaches of Kerala (a couple of states further south) are stunning with many way off the beaten track.